This Fluffy Chocolate Frosting recipe is a great choice for filling or frosting your cakes and cupcakes! It has a light and fluffy consistency, a delicious chocolate flavor, and pipes beautifully! This is the chocolate version of our Fluffy Vanilla Buttercream which we often refer to our on site. Because of the shortening in the recipe, this fluffy chocolate frosting is a bit more heat resistant than butter-based frostings. This is especially helpful for summertime gatherings! There is no such thing as a frosting that will not melt, but it’s nice to have an option that can withstand warmer temperatures a bit better. Plus, it is SO simple to make. Cream butter and shortening until creamy -- blend in the vanilla. Add powdered sugar, cocoa and most of the water. Mix throughly on medium speed for approximately 6 - 8 minutes until creamy and smooth. Add your remaining water as necessary. Scrape the sides of the bowl occasionally during the mixing process. This is a crusting buttercream, and works well with the viva paper towel method of smoothing (if you're going for that super smooth finish). I love this recipe. Tried it a couple months ago. I also added black dye, let it sit a few days and it turned into an awesome black bc. Good morning Lizbet, How much black dye did you use and how many days did you let it sit I the refrigerator? Can you replace water with cream or half/half or coffee creamer ? Can you use high ratio shortening in this recipe? Hi Terry, if you are going to use high ratio I would decrease the shortening amount to 1 1/4 cup (236g.) and increase the milk to 1/4 cup plus 2 to 3 Tablespoons milk or enough to make it the consistency you like. I made this frosting yesterday and it was really very good. Definitely a keeper. I used high ratio shortening and used a bit less of it based on BeBe’s comment above. I also used coffee instead of water/milk and added as needed, using less than the 1/2 cup called for. Will definitely make this again. Hi Joan, thanks for your post! Hi Claudia, I think it is fine to be out 3 days. I would keep it out of direct sunlight and in a cool area. This recipe is wonderful! I was using Wilton’s chocolate recipe – and this is far superior in taste and the way it frosts! 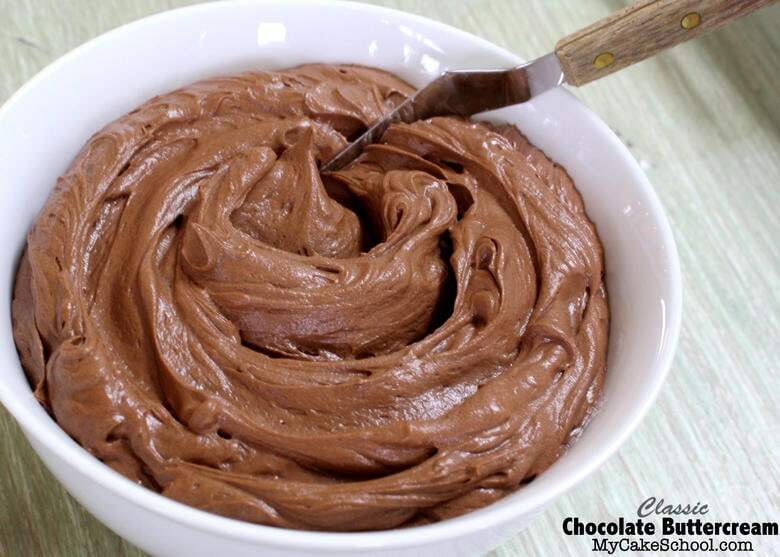 My go-to chocolate frosting recipe from now on! How does this differ from your classic chocolate frosting? Hi BakerJudy, the Classic Chocolate frosting is an all butter recipe. Both recipes are crusting buttercreams. Just made this tonight – this frosting is the perfect amount of sweetness. I followed the advice above to decrease the milk to 1/4 cup plus 2-3 tbs, but this wasn’t enough liquid. The frosting wasn’t as smooth and a little too crusty, so next time I would use the full 1/2 cup of milk. I traditionally use hi-ratio shortening, butter, and white margarine in my frosting, but I love that this recipe leaves out margarine. Thumbs up from my daughter and husband as well. Thanks for the recipe! Hi Carolyn, Thanks so much for posting your thoughts on this recipe. I’m happy you like the frosting! If I use this as a filling will it still crust? I won’t need a crusting BC for the filling, but I don’t want it too soft either because I want the filling to be a little on the thick side since I won’t be icing the cake, just a think layer of ganache under fondant. What do you recommend as a chocolate filling that’s a light chocolate taste? Used as a filling I don’t think it will crust as it won’t be in contact with the air. This recipe as well as our Classic Chocolate Frosting recipe has a light chocolate taste. 2 TABLESPOONS of vanilla? Should it be teaspoons? What type of vegetable shortening do you recommend? Will Spectrum organic vegetable shortening hold up as well as Crisco? Is it considered a high ratio shortening?